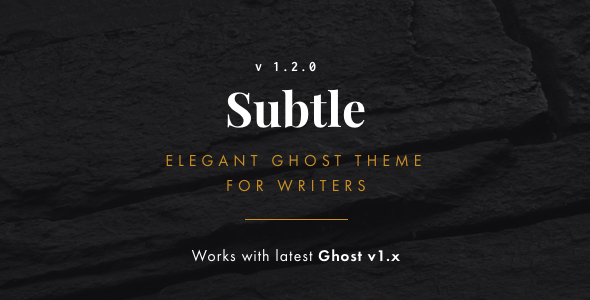 The Subtle Ghost theme v1.2.0 supports the latest Ghost version (1.5.1). Subtle offers an ideal basis for an amazing online blog or magazine. Its modern minimalist design with small subtle details, elegant quotes, custom image styles (wide, left or right aligned) puts your content in focus, and brings delightfully personalised browsing experience for your readers. The following is a list of main theme features. We're dedicated to keeping Subtle Ghost theme up to date. Version 1.2.0 ЁC 25 July 2017. Version 1.1.0 ЁC 29 July 2016. Version 1.0.4 ЁC 23 December 2015. Version 1.0.3 ЁC 16 November 2015. Version 1.0.2 ЁC 9 October 2015. Version 1.0.1 ЁC 14 September 2015. Version 1.0.0 ЁC 01 September 2015. High Resolution: Yes; Compatible Browsers: IE9, IE10, IE11, Firefox, Safari, Opera, Chrome, Edge; Software Version: Ghost 1.5.0; ThemeForest Files Included: HBS Files, HTML Files, CSS Files, JS Files; Columns: 1; Documentation: Well Documented; Layout: Responsive. Forma - Bold Masonry Theme For Ghost; BlogBox - Minimal and Bold Theme for Jekyll; BlogInn - Bold Theme for Jekyll; BlogInn - Bold Theme for Ghost; Curious - Blog and Magazine Ghost Theme; WildBird - Minimal and Elegant Ghost Theme; BlogBox - Minimal and Bold Ghost Theme. Keywords: blog, blogging, clean, content focused, cover image, elegant, fashion, ghost, magazine, minimal, minimalist, mobile, responsive, subscribe, typography.